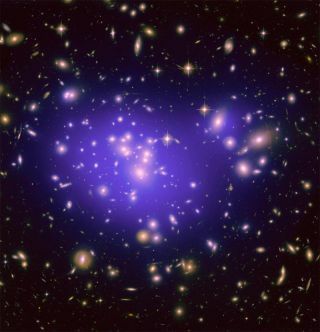 The galaxy cluster Abell 1689 is famous for the way it bends light in a phenomenon called gravitational lensing. Study of the cluster has revealed secrets about how dark energy shapes the universe. The universe is expanding — and it is doing so at the same rate in all directions, according to new measurements that appear to confirm the standard model of cosmology. Astrophysicist Jeremy Darling of the University of Colorado Boulder came to this conclusion after employing a research strategy known as "real-time cosmology," which seeks out the tiny changes in the universe that occur over human timescales. "Real-time cosmology offers new ways to observe the universe, including some observations and cosmological tests that cannot be made any other way," Darling told Space.com via email. Researchers discovered in 1998 that the universe is expanding at an accelerating rate — a surprising phenomenon believed to be due to a mysterious force called dark energy. Scientists don't know much about dark energy, except that it may be a property of the vacuum. In a bid to understand dark energy, researchers are making a wide array of cosmological tests and building new telescopes and instruments. "This work asks whether the expansion today — that is dominated by dark energy — is the same in all directions," Darling said. To make the measurements, Darling used data previously collected by other researchers on the motion of extra-galactic objects across the sky. The data allowed him to conclude that the cosmic expansion is indeed isotropic — in other words, the same in all directions — with a margin of error of 7 percent. "The constraints will get better with forthcoming data from the Gaia mission," said Loeb, who was not involved in the study. The European Space Agency's Gaia probe, which launched last December, is designed to create a three-dimensional map of Earth's Milky Way galaxy, mapping the motions of about 1 billion objects. This work should dramatically expand the sample size currently available to Darling and other researchers. Traditionally, most cosmological observations treat the universe as frozen in time: with a fixed age, fixed distances and fixed properties. So, to see the history of the universe, scientists must look at similar objects at different distances. Since the speed of light is finite, observers see more-distant objects as they existed at earlier cosmological times. The traditional strategy is thus to develop a statistical sample of cosmological "probes" across time to study how everything in the universe changes and evolves. There is one exception to this statistical approach, though: the cosmic microwave background (CMB), the so-called "first light" left over from the Big Bang that created the universe 13.8 billion years ago. Real-time cosmology, however, takes a different tack, relying on the idea that "now" is a changing time. "If we lived long enough, we would see objects receding away from us, growing smaller and fainter with distance, and accelerating," Darling said. "We would see the CMB roiling as new parts of the last scattering surface — the light horizon — receded. We would see gravity at work, causing large structures of galaxies and galaxy clusters to collapse and voids to expand. "Basically, any observable property should change in real time if we could watch for a very long time, or [if] we could measure things (positions, velocities) extremely precisely." Real-time cosmology measurements are "raw" observations that don't rely on models or statistical samples. "I could pick my favorite galaxy and watch it accelerate, shrink and dim as it recedes, directly revealing the dynamic aspect of the universe," Darling said. And, he added, real-time cosmology could help find answers to the most basic but important questions about the cosmos, such as whether or not the universe is rotating, the nature of dark energy and the masses of large-scale structures in the universe. While future instruments should give real-time cosmology a big boost, it's already possible to make major discoveries using this strategy, Darling said. And, he added, the International Celestial Reference Frame data already offer an early way to test the models and theories of real-time cosmology. The ICRF is the framework researchers use to calibrate their measurements of where objects are in the sky. "It is used to monitor the Earth's rotation and its wobbles and glitches," said Darling. "A network of radio-bright quasars are monitored regularly using very long baseline interferometry, and have been for decades. The measurements of the positions of these quasars are so precise that they can be used for all sorts of ancillary science." There are certain limitations, though — such as precision in redshift and astrometry, and the systematic errors associated with precise measurement. "Accelerations are expected to be less than 1 centimeter per second per year, and astrometry needs to be about 1 microarcsecond per year," Darling said. "The next step is to reach the limit of current VLBI [very-long-baseline interferometry] and then start using Gaia, which is likely to happen in three to five years." Loeb calls the work "original and interesting." However, he says, "within the broader context of cosmological data, one can use the cosmic microwave background to conclude that the expansion is isotropic to better than 0.001 percent, or else we would see temperature variations across the sky that are larger than observed." Darling acknowledges that this is true, but argues that the CMB temperature as observed depends only on the total amount of expansion that occurred between when the light was emitted and when it was observed. "It cannot be used to measure the expansion rate today (or at any other time)," Darling said. "It can, however, tell us about the overall, history-integrated anisotropy (i.e., did the universe grow more in one dimension than another since it was 300,000 years old, making one part of the sky appear colder/redder than another)." Most importantly, Darling said, real-time cosmology allows researchers to make "new measurements of the universe to test our theoretical understanding. This is how new discoveries are made. It is good to see that the universe as observed today behaves itself and supports the current cosmological paradigm and causes no conflict with the CMB." His research has been accepted for publication in the journal Monthly Notices of the Royal Astronomical Society. Follow Katia Moskvitch on Twitter @SciTech_Cat. Follow Space.com on Twitter @Spacedotcom. We're also on Facebookand Google+. Original article on Space.com.